4 Ways to Avoid Credibility Distractors in Your Social Media Post. Um…What’s the Problem? Summary: As social media marketers, it’s important to demonstrate strong oral and written communication skills that clearly project professionalism and confidence. Here is one big addition to your communication skill set to help with this goal. Learn four easy ways to avoid filler words and content. (#WorkloadWednesday) I recently had the horror of listening to myself on a recording my daughter made as we were driving the long I-5 stretch towards Los Angeles. This is an incredibly boring drive and we were passing time by asking random questions. I was shocked at how many times I used the word ‘um’, mainly as filler, to stall while considering my responses. With educators for parents, I remember having an ‘Um Jar’ – every time one of us used the word, we had to deposit a quarter into the jar. With five kids, it filled up quickly. Slowly, while depleting our allowance, we were eventually “broken” (at least temporarily) of the habit. In conversation, I think most of us have been guilty of using filler words. For me, this usually happens when I’m nervous and stumbling for words. For some it’s ‘um’, and others may use ‘so,’ ‘like,’ ‘OK’ or ‘alright.’ In fact, people around the world fill pauses in their own way. In Britain they say “uh,” Hebrew speakers say “ehhh,” the Turks say “mmmmm.” The Japanese say “eto” (eh-to) and “ano” (ah-no), Spanish speakers “esto”, and Mandarin speakers “neige” (NEH-guh) and “jiege” (JEH-guh). In Dutch and German it’s “uh, um, mmm.” In Swedish it’s “eh, ah, aah, m, mm, hmm, ooh, a and oh.” You get the picture. What we don’t realize when in the moment is how distracting these “credibility killers” are for your listeners and how they make you sound bad. Filler words represent verbal static that has to be filtered out by your audience. (It’s one of the communication barriers cited in an article by Stacey Hanke.) Why say it if the audience has to immediately filter it out? Repeated and excessive use of filler words weakens your credibility. It may be perceived as indicating lack of preparation, lack of knowledge, or lack of passion. All of these perceptions are bad for you. Fortunately, due to my “horror”, I’ve become much more aware and realize it’s OK to just pause, slow down and take a breath when speaking. As social media marketers, it’s important to have strong oral and written communications skills that clearly project professionalism and confidence. Have you ever read an article or social media post that left you thinking you wasted your time and wishing the post be purged from existence? This reaction may have resulted from the turkey being stuffed with unappetizing filler content. As a social media marketer, I’m sure you’re well schooled in the ideal length of a blog post and, I would guess, the majority of us are guilty of using filler content to extend the length of an article. How guilty are you? Filler content is not just useless content that you place in the middle of a blog but it can be wordy sentences and disorganization. If your content is beginning to seem less and less useful, it’s time to stop writing and start editing – the filler content must go. These words or phrases add absolutely no substance to your content and don’t do you any justice. They are semantically useless words used to fill up blog space or explain something that requires no explanation. What is your content saying? Your content should make a clear point. If the reader cannot distinguish each point in each paragraph, editing is required. Does everything flow correctly? Is your point introduced, explained and summarized in an easy to understand manner? Organization is a part of avoiding filler content. You often get caught up trying to make things flow smoother, so you place sentences where they don’t belong. Utilize an outline if you find yourself lacking organization. An outline is an additional organizational step that will actually save future editing steps. Be sure your article has an easily distinguishable introduction, middle and conclusion. When you’re avoiding filler content, remember that less is more. Many writers get caught up focusing on their word count or thinking that a lengthy article means more useful information – it is a terrible assumption. 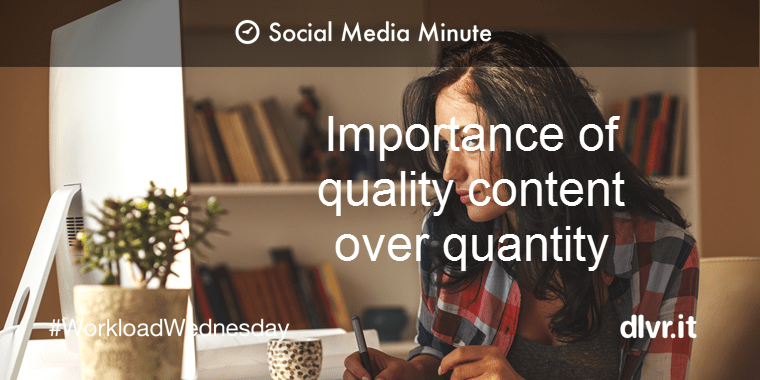 The phrase ‘quality over quantity’ should be foremost in your thoughts when writing an article. Food for thought: A higher word count does not necessarily mean better writing. We would love to hear from you! What are your tips for avoiding filler words? How many filler words did I use in this article? Bring it on!